When it comes to stem cells, too much of a good thing isn’t wonderful: Producing too many new stem cells may lead to cancer; producing too few inhibits the repair and maintenance of the body. In a paper published in Stem Cell Reports, USC researcher In Kyoung Mah, who works in the lab of Francesca Mariani, and colleagues at the University of California, San Diego, describe a key gene that maintains this critical balance. Called Prkci, the gene influences whether stem cells self-renew to produce more stem cells or differentiate into more specialized cell types, such as blood or nerves. In their experiments, the team grew mouse embryonic stem cells, which lacked Prkci, into embryo-like structures in the lab. Without Prkci, the stem cells favored self-renewal, generating large numbers of stem cells and, subsequently, an abundance of secondary structures. Upon closer inspection, the stem cells lacking Prkci had many activated genes typical of stem cells, and some activated genes typical of neural, cardiac and blood-forming cells. Therefore, the loss of Prkci can also encourage stem cells to differentiate into the progenitor cells that form neurons, heart muscle and blood. Prkci achieves these effects by activating or deactivating a well-known group of interacting genes that are part of the “Notch signaling pathway.” In the absence of Prkci, the Notch pathway produces a protein that signals to stem cells to make more stem cells. In the presence of Prkci, the Notch pathway remains silent, and stem cells differentiate into specific cell types. “We expect that our findings will be applicable in diverse contexts and make it possible to easily generate stem cells that have typically been difficult to generate,” said Mariani, principal investigator at the Eli and Edythe Broad Center for Regenerative Medicine and Stem Cell Research at USC. Additional co-authors on the study include Rachel Soloff and Stephen Hedrick from UCSD. The research was supported by USC and the Robert E. and May R. Wright Foundation. When it comes to stem cells, too much of a good thing isn’t wonderful: producing too many new stem cells may lead to cancer; producing too few inhibits the repair and maintenance of the body. Medical researchers now describe a key gene in maintaining this critical balance between producing too many and too few stem cells. A scientific team from the University of Southern California (USC) and the University of California, San Diego have described an important gene that maintains a critical balance between producing too many and too few stem cells. Called Prkci, the gene influences whether stem cells self-renew to produce more stem cells, or differentiate into more specialized cell types, such as blood or nerves. The control of asymmetric versus symmetric cell division in stem and progenitor cells balances self-renewal and differentiation to mediate tissue homeostasis and repair and involves key proteins that control cell polarity. In the case of excess symmetric division, too many stem-cell-like daughter cells are generated that can lead to tumor initiation and growth. Conversely, excess asymmetric cell division can severely limit the number of cells available for homeostasis and repair (Go´mez-Lo´pez et al., 2014; Inaba and Yamashita, 2012). The Notch pathway has been implicated in controlling stem cell self-renewal in a number of different contexts (Hori et al., 2013). However, how cell polarity, asymmetric cell division, and the activation of determinants ultimately impinges upon the control of stem cell expansion and maintenance is not fully understood. In this study, we examine the role of an atypical protein kinase C (aPKC), PRKCi, in stem cell self-renewal and, in particular, determine whether PRKCi acts via the Notch pathway. PKCs are serine-threonine kinases that control many basic cellular processes and are typically classified into three subgroups—conventional, novel, and the aPKCs iota and zeta, which, in contrast to the others, are not activated by diacylglyceride or calcium. The aPKC proteins are best known for being central components of an evolutionarily conserved Par3-Par6-aPKC trimeric complex that controls cell polarity in C. elegans, Drosophila, Xenopus, zebrafish, and mammalian cells (Suzuki and Ohno, 2006). Mice deficient in Prkcz are grossly normal, with mild defects in secondary lymphoid organs (Leitges et al., 2001). In contrast, deficiency of the Prkci isozyme results in early embryonic lethality at embryonic day (E)9.5 (Seidl et al., 2013; Soloff et al., 2004). A few studies have investigated the conditional inactivation of Prkci; however, no dramatic changes in progenitor generation were detected in hematopoietic stem cells (HSCs) or the brain (Imai et al., 2006; Sengupta et al., 2011), although one study found evidence of a role for Prkci in controlling asymmetric cell division in the skin (Niessen et al., 2013). Analysis may be complicated by functional redundancy between the iota and zeta isoforms and/or because further studies perturbing aPKCs in specific cell lineages and/or at specific developmental stages are needed. Therefore, a complete picture for the requirement of aPKCs at different stages of mammalian development has not yet emerged. Figure 1. Prkci/ EBs Contain Cells with Pluripotency Characteristics (A and A0 ) Day (d) 12 heterozygous EBs have few OCT4/E-CAD+ cells, while null EBs contain many in clusters at the EB periphery. Inset: OCT4 (nucleus)/E-CAD (cytoplasm) double-positive cells. (B and B0 ) Adjacent sections in a null EB show that OCT4+ cells are likely also SSEA1+. (C) Dissociated day-12 Prkci/ EBs contain five to six times more OCT4+ and approximately three times more SSEA1+ cells than heterozygous EBs (three independent experiments). (D and D0 ) After 2 days in ES cell culture, no colonies are visible in null SSEA1 cultures while present in null SSEA1+ cultures (red arrows). (E–E00) SSEA1+ sorted cells can be maintained for many passages, 27+. (E) Prkci+/ sorted cells make colonies with differentiated cells at the outer edges (n = 27/35). (E0 ) Null cells form colonies with distinct edges (n = 39/45). (E00) The percentage of undifferentiated colonies is shown. ***p < 0.001. (F) Sorted null cells express stem cell and differentiation markers at similar levels to normal ES cells (versus heterozygous EBs) (three independent experiments). (G) EBs made from null SSEA1+ sorted cells express germ layer marker genes at the indicated days. Error bars indicate mean ± SEM, three independent experiments. Scale bars, 100 mm in (A, D, and E); 25 mm in (B). See also Figure S1. Functional Pluripotency Tests If primary EBs have a pluripotent population with the capacity to undergo self-renewal, they can easily form secondary EBs (O’Reilly et al., 2011). Using this assay, we found that more secondary EBs could be generated from Prkci/ versus Prkci+/ EBs, especially at days 6, 10, and 16; even when plated at a low density to control for aggregation (Figure S1H). To test whether SSEA1+ cells could maintain pluripotency long term, FACS-sorted Prkci/ SSEA1+ and SSEA1 cells were plated at a low density and maintained under ES cell culture conditions. SSEA1 cells were never able to form identifiable colonies and could not be maintained in culture (Figure 1D). SSEA1+ cells, however, formed many distinct colonies after 2 days of culture, and these cells could be maintained for over 27 passages (Figures 1D0 , 1E0 , and 1E00). Prkci+/ SSEA1+ cells formed colonies that easily differentiated at the outer edge, even in the presence of LIF (Figure 1E). In contrast Prkci/ SSEA1+ cells maintained distinct round colonies (Figure 1E0 ). Next, we determined whether null SSEA1+ cells expressed pluripotency and differentiation markers similarly to normal ES cells. Indeed, we found that Oct4, Nanog, and Sox2 were upregulated in both null SSEA1+ EB cells and heterozygous ES cells. In addition, differentiated markers (Fgf5, T, Wnt3, and Afp) and tissue stem/progenitor cell markers (neural: Nestin, Sox1, and NeuroD; cardiac: Nkx2-5 and Isl1; and hematopoietic: Gata1 and Hba-x) were downregulated in both SSEA1+ cells and heterozygous ES cells (Figure 1F). SSEA1+ cells likely have a wide range of potential, since EBs generated from these cells expressed markers for all three germ layers (Figure 1G). In addition, as expected, EBs made from null SSEA1+ cells were (F) Sorted null cells morphologically abnormal, similar to the EBs made from unsorted Prkci/ ES cells (Figure S1G0 ). Thus, taken together, several assays indicate that the OCT4 and SSEA1+ populations enriched in null EBs represent pluripotent stem cells that can self-renew and have broad differentiation capacity. First, we found that null EBs contained many more NESTIN- and PAX6-positive cells than heterozygous EBs (Figures 3A and 3B; Figures S3A and S3B) (neural stem A and progenitor markers) (Sansom et al., 2009; Tohyama et al., 1992). In addition, quantification of PAX6 immuno- fluorescence (easier to quantify because of its nuclear localization) using a pixel count method (Fogel et al., 2012) revealed more abundant PAX6+ cells in null EBs versus heterozygous EBs. This difference was no longer evident at day 16, presumably because most of the new neural progenitors had differentiated (Figure 3D). Indeed, differentiated neuronal markers MAP2 and TUJ1 could be expressed in null cell cultures (Figures 3C and 3C0 ). Retinoic acid (RA) treatment both in EBs and ES cells promotes neurogenesis (Xu et al., 2012). We found that, even under RA induction, null cultures contained a larger population of NESTIN+ and a smaller population of TUJ1+ cells when compared to heterozygous cultures (Figures 3E and 3F). Again, null neural progenitors were capable of undergoing some differentiation, since we could find cells expressing NEUROD, NEUN, and MAP2 (Figures 3F0 –3F000). We also assessed neurogenesis in monolayer culture, using media that promotes neural stem cell generation supplemented with a low concentration of RA (Xu et al., 2012). Similar to the EB assay, we found that null ES cells generated a larger NESTIN+ and smaller TUJ1+ population compared to heterozygous ES cells (Figures S3C and S3D). Like in EBs, MAP2- and TUJ1-positive cells could still be found in the null cultures (Figure S3D0 ). Thus, using several different neural-induction assays, we found that the absence of Prkci correlates with the production of more neural progenitors and that, although these cells may favor self-renewal, they are still capable of progressing toward differentiation. Figure 3. Neural Stem Cell Populations Are Increased in Null EBs (A–C0 ) Prkci/ EBs (B) have more NESTINpositive cells than Prkci+/ EBs (A). (C and C0 ) MAP2 and TUJ1 are expressed in null EBs, similarly to heterozygous EBs (data not shown). (D) EBs were assessed for PAX6 expression, and the images were used for quantification (Figures S3A and S3B). The pixel count ratio of PAX6+ cells in null EBs (green) is substantially higher than that found in heterozygous EBs (black) (three independent experiments; mean ± SEM; *p < 0.05). (E–F000) Day 4 after RA treatment, Prkci/ EBs have more NESTIN- than TUJ1-positive neurons (E and F). However, null cells can still terminally differentiate into NEUROD-, NEUN-, and MAP2-positive cells (F0 –F000). Scale bars, 25 mm in (A and C) and 50 mm in (E). See also Figure S3. The Generation of Cardiomyocyte and Erythrocyte Progenitors Is Also Favored Next, we examined ISL1 expression (a cardiac stem cell marker) by immunofluorescence and found that Prkci/ EBs contained larger ISL1 clusters compared with Prkci+/ EBs; this was confirmed using an image quantification assay (Figures 4A, 4A0 , and 4C). Differentiated cardiac cells and ventral spinal neurons can also express ISL1 (Ericson et al., 1992); therefore, we also examined Nkx2-5 expression, a better stem cell marker and regulator of cardiac progenitor determination (Brown et al., 2004), by RT-PCR and immunofluorescence. In null EBs, Nkx2-5 was upregulated (Figure 4D). In addition, in response to RA, which can promote cardiac fates in vitro (Niebruegge et al., 2008), cells expressing NKX2-5 were more prevalent in null versus heterozygous EBs (Figures 4B and 4B0 ).The abundant cardiac progenitors found in null EBs were still capable of undergoing differentiation (Figures 4E–4F0 ). Indeed, more cells exhibited the striated pattern characteristic of a-ACTININ in null versus heterozygous EBs with RA induction (Figures 4F and 4F0 ). In addition, many more Prkci/ EBs were beating after days 6 and 12 of culture (Figure 4G). Figure 4. Cardiomyocyte and Erythrocyte Progenitors Are Increased in Prkci/ EBs (A–F0 ) In (A, A0 , E, and E0 ), Prkci/ EBs cultured without LIF have more ISL1 (cardiac progenitor marker) and a-ACTININ-positive cells compared to heterozygous EBs. (C) At day (d) 9, the pixel count ratio for ISL1 expression indicates that null EBs (green) have larger ISL1 populations than heterozygous EBs (black) (three independent experiments, n = 20 heterozygous EBs, 21 null EBs total; mean ± SEM; *p < 0.05). In (B, B0 , D, F, and F0 ), RA treatment induces more NKX2-5 (both nuclear and cytoplasmic) and a-ACTININ expression in null EBs. Arrows point to fibers in (F0 ). (G) Null EBs (green) generate more beating EBs with RA treatment compared to heterozygous EBs (black) (four independent experiments; mean ± SEM; *p < 0.05, ***p < 0.001). (H) Dissociated null EBs of different stages (green) generate more erythrocytes in a colony-forming assay (CFU-E) (four independent experiments; mean ± SEM; **p < 0.01). (I) Examples of red colonies. (J) Gene expression for primitive HSC markers is upregulated in null EBs (relative to heterozygous EBs) (three independent experiments; mean ± SEM). Scale bars, 50 mm in (A, B, and E); 100 mm in (F), and 25 mm in (I). See also Figure S4. Prkci/ Cells Are More Likely to Inherit NUMB/aNOTCH1 Symmetrically The enhanced production of both pluripotent and tissue stem cells suggests that the mechanism underlying the action of Prkci in these different contexts is fundamentally similar. Because the Notch pathway controls stem cell self-renewal in many contexts (Hori et al., 2013), and because previous studies implicated a connection between PRKCi function and the Notch pathway (Bultje et al., 2009; Smith et al., 2007), we examined the localization and activation of a key player in the Notch pathway, NUMB, (Inaba and Yamashita, 2012). Differences in NUMB expression were first evident in whole EBs, where polarized expression was evident in the ectodermal and endodermal epithelia of heterozygous EBs, while Prkci/ EBs exhibited a more even distribution (Figures 5A–5B0 ). To more definitively determine the inheritance of NUMB during cell division, doublets undergoing telophase or cytokinesis were scored for symmetric (evenly distributed in both cells) or asymmetric (unequally distributed) NUMB localization (examples: Figures 5C and 5C0 ). In dissociated day-10 EBs, Prkci+/ doublets displayed somewhat less symmetric versus asymmetric inheritance, while Prkci/ doublets exhibited nearly four times more symmetric versus asymmetric inheritance (Figure 5D). Although individual cells from null EBs that were OCT4+ or PAX6+ more likely to exhibit non-polarized NUMB distribution (Figures S5A and S5B), we decided to use an assay that allowed for FACS purifi- cation, followed by the more stringent doublet assay. Therefore, we chose CD24 (heat-stable antigen; BA-1), a cell-surface marker that is highly expressed in pre-differentiated neurons and neuroblasts (Pruszak et al., 2009), and tested this marker as a method to enrich for cells destined to differentiate into neurons (see Supplemental Experimental Procedures). To assess NUMB localization, FACSsorted CD24 cells isolated from the RA-treated EBs were then put in culture for 24 hr, and doublets were scored. Both Prkci/ CD24high and CD24low doublets exhibited more symmetric versus asymmetric NUMB localization when compared to Prkci+/ doublets (Figure 5E) (>23 more was observed for CD24low doublets; 1.5 ± 0.25 [null] versus 0.67 ± 0.2 [heterozygous]). Thus, in summary, loss of Prkci favors the generation of cells with symmetric NUMB distribution, even during EB differentiation. In addition, in situations where neurogenesis is stimulated (RA treatment), loss of Prkci favors symmetric NUMB distribution in both the CD24high/low subpopulations. Because NUMB can be directly phosphorylated by aPKCs (both PRKCi and PRKCz) (Smith et al., 2007; Zhou et al., 2011), loss of Prkci might be expected to lead to decreased NUMB phosphorylation. Three NUMB phosphorylation sites—Ser7, Ser276, and Ser295—could be aPKC mediated (Smith et al., 2007). By immunofluorescence, we found that one of the most well-characterized sites (Ser276), was strongly inactivated in null versus heterozygous EBs, especially in the core (Figures 5F and 5G). Western analysis also confirmed that the levels of pNUMB (Ser276) were decreased in null versus heterozygous EBs (Figure S5F). Thus, genetic inactivation of Prkci leads to a marked decrease in the phosphorylation status of NUMB. Notch pathway inhibition by NUMB has been observed in flies and mammals (Berdnik et al., 2002; French et al., 2002). Therefore, we investigated whether reduced Numb activity in Prkci/ EBs might lead to enhanced NOTCH1 activity and the upregulation of the downstream transcriptional readouts (Meier-Stiegen et al., 2010). An overall increase in NOTCH1 activation was supported by western blot analysis showing that the level of activated NOTCH1 (aNOTCH1) was strongly increased in day 6 and day 10 null versus heterozygous EBs (Figure S5G). This was supported by immunofluorescence in EBs, where widespread strong expression of aNOTCH1 was seen in most null cells (Figures 5I and 5I0 ), while in heterozygous EBs, this pattern was observed only in the OCT4+ cells (Figures 5H and 5H0 ). Figure 5. Prkci/ Cells Preferentially Inherit Symmetric Localization of NUMB and aNOTCH1 and Notch Signaling Is Required for Stem Cell Self-Renewal in Null Cells (A–B0 ) In (A and B), day (d)-7 heterozygous EBs have polarized NUMB localization within epithelia and strong expression in the endoderm, while null EBs have a more even distribution. (A0 and B0 ) Enlarged views. (C and C0 ) Asymmetric and symmetric NUMB expression examples. (D) Doublets from day-10 null EBs have more symmetric inheritance when compared to day-10 heterozygous doublets (three independent experiments; mean ± SEM; **p < 0.01). A red line indicates a ratio of 1 (equal percent symmetric and asymmetric). (E) CD24 high null doublets exhibited more symmetric NUMB inheritance than CD24 high heterozygous doublets (three independent experiments; mean ± SEM; *p < 0.05). A red line indicates where the ratio is 1. (F and G) Decreased pNUMB (Ser276) is evident in the core of null versus heterozygous EBs (n = 10 of each genotype). (H–I0 ) In (H and I), aNOTCH1 is strongly expressed in heterozygous EBs, including both OCT4+ and OCT4 cells, while strong aNOTCH1 expression is predominant in OCT4+ cells of null EBs (n = 10 of each genotype)). (H0 and I0 ) Enlarged views of boxed regions. OCT4+ cells are demarcated with dotted lines. (J and J0 ) OCT4+ cells express HES5 strongly in the nucleus (three independent experiments). (K) Null doublets from dissociated EBs have more symmetric aNOTCH1 inheritance compared to heterozygous doublets (three independent experiments; mean ± SEM; **p < 0.01). A red line indicates where the ratio is 1. (L) CD24high Prkci/ doublets exhibit more symmetric aNOTCH1 than CD24high heterozygous doublets (three independent experiments; mean ± SEM; *p < 0.05). A red line indicates where the ratio is 1. (M and M0 ) Examples of asymmetric and symmetric aNOTCH1 localization. (N and O) Day-3 DMSO-treated null ES colonies show strong AP staining all the way to the colony edge in (N). Treatment with 3 mM DAPT led to more differentiation in (O). (P–R) OCT4 is strongly expressed in day-4 DMSO-treated null ES cultures (P). With DAPT (Q,R), OCT4 expression is decreased. (S) Working model: In daughter cells that undergo differentiation, PRKCi can associate with PAR3 and PAR6. NUMB is recruited and directly phosphorylated. The activation of NUMB then leads to an inhibition in NOTCH1 activation and stimulation of a differentiation/maintenance program. In the absence of Prkci, the PAR3/PAR6 complex cannot assemble (although it may do so minimally with Prkcz). NUMB asymmetric localization and phosphorylation is reduced. Low levels of pNUMB are not sufficient to block NOTCH1 activation, and activated NOTCH1 preserves the stem cell self-renewal program. We suggest that PRKCi functions to drive differentiation by pushing the switch from an expansion phase that is symmetric to a differentiation and/or maintenance phase that is predominantly asymmetric. In situations of low or absent PRKCi, we propose that the expansion phase is prolonged. Scale bars, 50 mm in (A, B, F, G, H, I, J, J0 , P–R); 200 mm in (A0 and B0 ); 25 mm in (C, C0 , M, and M0 ); and 100 mm in (H0 , I0 , N, and O). See also Figure S5. To examine the localization of aNOTCH1 and to better quantify the results seen in Figures 5H and 5I, doublets from dissociated EBs were scored. As seen with NUMB localization, null doublets were more likely to have symmetric localization of aNOTCH1 in comparison to heterozygous doublets (Figure 5K; examples in Figures 5M and 5M0 ). In addition, both CD24high and CD24low doublets from RA-treated null EBs were more likely to exhibit symmetric aNOTCH1 distribution versus doublets from RA-treated heterozygous EBs (Figure 5L; 3.46 ± 0.8 [null] versus 0.59 ± 0.06 [heterozygous] in CD24low doublets). In addition, by RT-PCR, the expression of Notch downstream genes Hes1, Hes5, Hey1, and Hey2 was increased in null versus heterozygous EBs (Figure S5I). Furthermore, HES5 by immunofluorescence was broadly expressed at similar levels in both null and heterozygous cells (Figures 5J and 5J0 ; Figures S5H and S5H0 ) but more strongly expressed in null OCT4+ cells (Figures 5J and 5J0 ). Thus, loss of Prkci is associated with NOTCH1 activation, aNOTCH1 symmetric localization, and the upregulation of Hes/Hey downstream genes in several assays. To determine whether Notch pathway activation is required in the absence of Prkci, we examined AP activity and OCT4 expression while blocking the Notch pathway using DAPT to inhibit g-secretase (Sastre et al., 2001). DMSO-treated null ES cells stayed undifferentiated (sharp-edged colonies, strong AP staining); however, treatment of null ES cells with 3 mM DAPT led to more differentiation (AP-negative cells with cellular extensions) (Figures 5N, 5O, and S5J). In addition, OCT4 is strongly expressed in day-4 control ES cell cultures; however, in the presence of DAPT, OCT4 expression is much decreased both in monolayer culture (Figures 5P–5R) and in null EBs (48% lower OCT4+ signal versus DMSO controls, pixel counting on EB sections; data not shown). These results support the idea that activated Notch signaling is required in the absence of Prkci to see enhanced pluripotency. Taken together, the combined effects of decreased NUMB activation, favored symmetric distribution of NUMB and aNOTCH1 and increased NOTCH1 activity support a model whereby loss of Prkci leads to sustained generation of pluripotent and some tissue stem cell populations (Figure 5S; and see Discussion). Additional Loss of PRKCz Activity Boosts the Number of OCT4-, SSEA1-, and STELLA-Positive Cells The generation and maintenance of pluripotent stem cells from new sources or tissue stem cells for basic or translational research can be challenging, and there is need for new in vitro strategies. A PKC inhibitor (Go¨6983) that inhibits PKCa, -b, -g, -d, and -z has been used to help maintain mouse and rat ES cells in the absence of LIF (Dutta et al., 2011; Rajendran et al., 2013). Thus, we hypothesized that treating null cells with Go¨6983 might lead to better stem cell expansion compared to loss of just Prkci. In our hands, we found that, under differentiation conditions (no LIF), heterozygous ES cells treated with the inhibitor for 4 days still underwent differentiation (Figure 6A), while treated null ES cells largely stayed undifferentiated (Figure 6A0 ; Figure S6A). Drug treatment of heterozygous EBs boosted the generation of OCT4-expressing cells (Figure 6B), while treatment of null EBs resulted in an even larger OCT4+ population (Figure 6B0 ). NUMB localization was also moderately affected (Figure S6B). By cell sorting, we found that drug treatment significantly increased the percentage of OCT4+ cells in both Prkci+/ and Prkci/ EBs (Figures 6C and 6C0 ; Figures S6C and S6C0 ). Interestingly, Go¨6983 treatment also boosted the generation of SSEA1+ cells in both null and heterozygous EBs (Figures 6D and 6D0 ; Figures S6D and S6D0 ). SSEA1 is expressed in BLIMP1-positive PGCs derived from mouse epiblast stem cells (Hayashi and Surani, 2009). Also, PGC-like cells can be derived from isolated SSEA1+/OCT4+ EB cells (Geijsen et al., 2004). Therefore, we speculated that the increase in SSEA1 and OCT4 due to Go¨6983 treatment could represent an increase in the generation of PGC-like cells instead of undifferentiated ES cells. Therefore, we examined the expression of STELLA (a PGC marker). As expected, heterozygous EBs contain small clusters of STELLA+ cells similar to EBs made of wild-type cells (Figure 6E) (Payer et al., 2006). The addition of Go¨6983 to Prkci+/ EBs induced a modest increase in the number of STELLA+ cells present in the clusters (Figure 6F). Without drug treatment, null EBs contained more clusters, and the clusters contained more STELLA+ cells when compared to heterozygous EBs (Figures 6E and 6G). Interestingly, when Prkci/ EBs were treated with Go¨6983, the generation of STELLA+ cells was strongly enhanced (Figure 6G versus Figure 6H). Because undifferentiated ES cells can still express STELLA (Payer et al., 2006), we co-stained Prkc EBs for VASA (a more differentiated PGC marker). We found many cells that were double positive (a little less than half) (Figure 6K) but also cells that expressed VASA only and STELLA only (23 more than VASA only) (Figures 6I–6K, red/green arrows). Therefore, the combined effect of loss of Prkci and PKC inhibition via Go¨6983 treatment leads to the production of STELLA and VASA+ PGC-like cells. Figure 6. Additional Inhibition of PRKCz Results in an Even Higher Percentage of OCT4-, SSEA1-, and STELLA-Positive Cells (A and A0 ) After day 4 without LIF, heterozygous ES cells undergo differentiation in the presence of Go¨6983, while null ES cells stay as distinct colonies in (A0 ). (B and B0 ) Go¨6983 stimulates an increase in OCT4+ populations in heterozygous EBs and an even larger OCT4+ population in null EBs in (B0 , insets: green and red channels separately). (C–D0 ) An even higher percentage of cells are OCT4+ (C and C0 ) and SSEA1+ (D and D0 ) with Go¨6983 treatment (day 12, three independent experiments). (E and F) More STELLA+ clusters containing a larger number of cells are present in drugtreated heterozygous EBs. (G and H) Null EBs also have more STELLA+ clusters and cells. Drug-treated null EBs exhibit a dramatic increase in the number of STELLA+ cells. (I–K) Some cells are double positive for STELLA and VASA in drug-treated null EBs (yellow arrows). There are also VASAonly (green arrows) and STELLA-only cells (red arrows) (three independent experiments). (L–P) Treatment with ZIP results in an increase in OCT4+ and STELLA+ cells. ZIP treatment also results in more cells that are VASA+ (three independent experiments); n = 11 for Prkci+/, and n = 13 for Prkci+/ + ZIP; n = 14 for Prkci/, and n = 20 for Prkci/ + ZIP; eight EBs assayed for both STELLA and VASA expression). Scale bars, 100 mm in (A and A0 ); 50 mm in (B and B0 ); and 25 mm in (E, I, and L). See also Figure S6. 10 S.
Next, we examined whether the more specific aPKC inhibitor, ZIP, a myristolated aPKC pseudosubstrate with competitive binding to p62, had similar effects (Price and Ghosh, 2013; Tsai et al., 2015; Yao et al., 2013). We found that both heterozygous and null EBs treated with ZIP contained more OCT4+ cells compared to un-treated EBs (Figures 6L–6O). In addition, like Go¨6983, ZIP treatment resulted in a modest increase in the percentage of SSEA1+ cells found in heterozygous EBs and a strong increase in the percentage of SSEA1+ cells in null EBs (Figures S6E– S6F0 ). Furthermore, like Go¨6983, both STELLA+ and VASA+ populations were increased with ZIP treatment (Figure 6P). Thus, both pluripotent and PGC-like cells can be abundantly generated with Go¨6983 or ZIP treatment, suggesting that strategies that inhibit both PRKCi and/or PRKCz may be useful to maintain stem cell self-renewal and/or generate abundant PGC-like cells. These studies, together with data presented here, provide genetic evidence that evolutionarily conserved polarity pathways may play a central role in NOTCH1 activation. and stem cell self-renewal in mammals. Further genetic studies using Cre transgenes that are specific for progenitors in the neural plate, primitive erythrocytes, cardiomyocytes, and other progenitors to ablate aPKC function will be needed to determine how generally this mechanism is used in diverse tissues. Utility of Inhibiting aPKC Function Loss of Prkci resulted in EBs that contained slightly more STELLA+ cells than EBs made from +/ cells. Furthermore, inhibition of both aPKC isozymes by treating Prkci null cells with the PKC inhibitor Go¨6983 or the more specific inhibitor, ZIP, strongly promoted the generation of large clusters of STELLA+ and VASA+ cells, suggesting that inhibition of both isozymes is important for PGC progenitor expansion (Figure 6). It is unclear what the mechanism for this might be; however, one possibility is that blocking both aPKCs is necessary to promote NOTCH1 activation in PGCs or in PGC progenitor cells that may ordinarily have strong inhibitions to expansion (Feng et al., 2014). Regardless of mechanism, the ability to generate PGC-like cells in culture is notoriously challenging, and our results provide a method for future studies on PGC specification and differentiation. Expansion of stem/progenitor pools may not be desirable in the context of cancer. Prkci has been characterized as a human oncogene, a useful prognostic cancer marker, and a therapeutic target for cancer treatment. Overexpression of Prkci is found in epithelial cancers (Fields and Regala, 2007), and Prkci inhibitors are being evaluated as candidate cancer therapies (Atwood et al., 2013; Mansfield et al., 2013). However, because our results show that Prkci inhibition leads to enhanced stem cell production in vitro, Prkci inhibitor treatment as a cancer therapy might lead to unintended consequences (tumor overgrowth), depending on the context and treatment regimen. Thus, extending our findings to human stem and cancer stem cells is needed. In summary, here, we demonstrate that loss of Prkci leads to the generation of abundant pluripotent cells, even under differentiation conditions. In addition, we show that tissue stem cells such as neural stem cells, primitive erythrocytes, and cardiomyocyte progenitors can also be abundantly produced in the absence of Prkci. These increases in stem cell production correlate with decreased NUMB activation and symmetric NUMB localization and require Notch signaling. Further inhibition of Prkcz may have an additive effect and can enhance the production of PGC-like cells. Thus, Prkci (along with Prkcz) may play key roles in stem cell self-renewal and differentiation by regulating the Notch pathway. Furthermore, inhibition of Prkci and or Prkcz activity with specific small-molecule inhibitors might be a powerful method to boost stem cell production in the context of injury or disease. Supplemental Information includes Supplemental Experimental Procedures, six figures, and two tables and can be found with this article online at http://dx.doi.org/10.1016/j.stemcr. 2015.09.021. Atwood, S.X., Li, M., Lee, A., Tang, J.Y., and Oro, A.E. (2013). GLI activation by atypical protein kinase C i/l regulates the growth of basal cell carcinomas. Nature 494, 484–488. Baum, C.M., Weissman, I.L., Tsukamoto, A.S., Buckle, A.M., and Peault, B. (1992). Isolation of a candidate human hematopoietic stem-cell population. Proc. Natl. Acad. Sci. USA 89, 2804–2808. Berdnik, D., To¨ro¨k, T., Gonza´lez-Gaita´n, M., and Knoblich, J.A. (2002). The endocytic protein alpha-Adaptin is required for numb-mediated asymmetric cell division in Drosophila. Dev. Cell 3, 221–231. Boeckeler, K., Rosse, C., Howell, M., and Parker, P.J. (2010). Manipulating signal delivery – plasma-membrane ERK activation in aPKC-dependent migration. J. Cell Sci. 123, 2725–2732. It wasn’t the pristine 27-hole course that drew more than 120 stem cell researchers from USC and beyond to the Desert Princess Golf Resort near Palm Springs, Calif. It was the sixth annual retreat for the Eli and Edy the Broad Center for Regenerative Medicine and Stem Cell Research at USC, which took place on Oct. 20-­21. 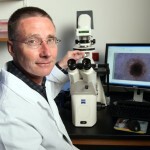 The two-day, overnight retreat featured a plenary lecture by Clive Svendsen, director of the Regenerative Medicine Institute at Cedars-Sinai Medical Center, about the contribution of induced pluripotent stem (iPS) cells to regenerative medicine, particularly to studying and developing treatments for neurological disorders. The retreat also included presentations by winners of the first Regenerative Medicine Initiative (RMI) Awards, which provide up to two years of seed funding for multi-investigator research collaborations that harness the full potential of USC-affiliated faculty members. The three winning teams are using various stem/progenitor cells that might lead to future therapies for certain forms of deafness, bone defects and pediatric leukemia. Many other principal investigators, postdoctoral and graduate students shared innovative research advancing several key areas of regenerative medicine. Rong Lu, who will leave Stanford University to join USC’s stem cell research center as a principal investigator in January, talked about her new cellular “tracking system” for hematopoietic, or blood-forming stem cells. The system allows for the more effective study of blood and other types of cancers. Min Yu, who will leave Massachusetts General Hospital at Harvard Medical School to accept a joint appointment as a principal investigator at USC’s stem cell research center and the USC Norris Comprehensive Cancer Center in January, discussed how to filter out circulating cancer stem cells from billions of other blood cells to understand and stop cancer’s spread. USC research associate Hu Zhao and research assistants Yichen Li and Yingxiao Shi gave presentations. Postdoctoral students who presented research included Mohamed Hammad, Lori O’Brien, Sandeep Paul and Saaket Varma. PhD student presenters included Wen-Hsuan Chang, Guanyi Huang, Sapna Jain, Erin Moran, Marie Rippen and Yuki Yamaguchi. The retreat also showcased the USC stem cell research center’s core facilities for stem cell sorting, derivation, culture, iPS programming, imaging and therapeutic screening. During the cocktail hour, guests exchanged new ideas while voting on their favorite posters, which introduced research opportunities related to the Development, Stem Cells, and Regenerative Medicine PhD program. Retreat sponsors included the California Institute for Regenerative Medicine Amgen, Sanofi, Zeiss, Leica Microsystems, Fluidigm, Lonza and Novogenix Laboratories LLC. How do humans and other mammals get so brainy? USC researcher Wange Lu and his colleagues shed new light on this question in a paper published in the journal Cell Reports on Oct. 24. 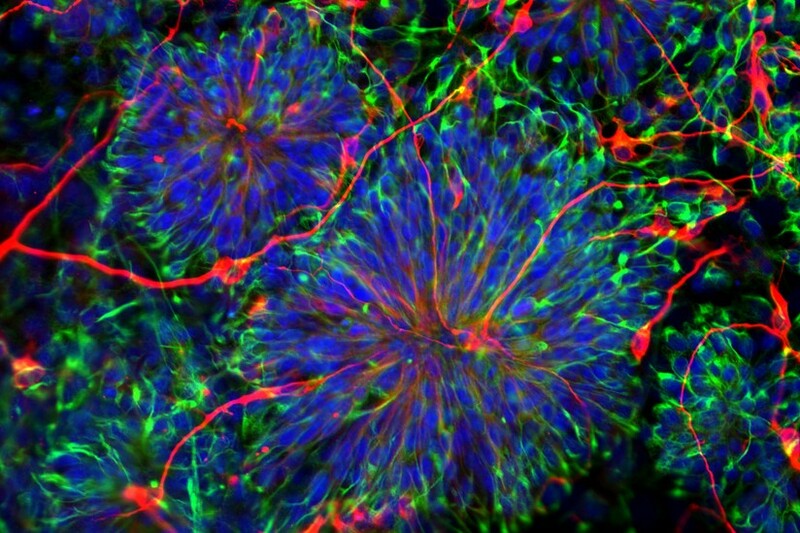 The researchers donned their thinking caps to explain how neural stem and progenitor cells differentiate into neurons and related cells called glia. Neurons transmit information through electrical and chemical signals; glia surround, support and protect neurons in the brain and throughout the nervous system. Glia do everything from holding neurons in place to supplying them with nutrients and oxygen to protect them from pathogens. By studying the embryo neural stem cells of mice in a petri dish, Lu and his colleagues discovered that a protein called SMEK1 promotes the differentiation of neural stem and progenitor cells. At the same time, SMEK1 keeps these cells in check by suppressing their uncontrolled proliferation. The researchers also determined that SMEK1 doesn’t act alone: It works in concert with Protein Phosphatase 4 to suppress the activity of PAR3, a third protein that discourages neurogenesis — the birth of new neurons. With PAR3 out of the picture, neural stem cells and progenitors are free to differentiate into new neurons and glia. Neural stem and progenitor cells offer tremendous promise as a future treatment for neurodegenerative disorders, and understanding their differentiation is the first step toward harnessing the cells’ therapeutic potential. This could offer new hope for patients with Alzheimer’s, Parkinson’s and many other currently incurable diseases. Co-authors from the Broad Center included Vicky Yamamoto, Si Ho Choi and Zhong Wei. Co-authors Hee-Ryang Kim and Choun-Ki Joo work at the Catholic University of Korea in Seoul, and first author Jungmook Lyu is affiliated with both institutions. Funding for the study came from the National Institutes of Health (grant number 5R01NS067213). Protein phosphatase 4 and Smek complex negatively regulate Par3 and promote neuronal differentiation of neural stem/progenitor cells. Cell Rep. 2013 Nov 14;5(3):593-600. http://d.doi.org:/10.1016/j.celrep.2013.09.034. Epub 2013 Oct 24. Neural progenitor cells (NPCs) are multipotent cells that can self-renew and differentiate into neurons and glial cells. However, mechanisms that control their fate decisions are poorly understood. Here, we show that Smek1, a regulatory subunit of the serine/threonine protein phosphatase PP4, promotes neuronal differentiation and suppresses the proliferative capacity of NPCs. We identify the cell polarity protein Par3, a negative regulator of neuronal differentiation, as a Smek1 substrate and demonstrate that Smek1 suppresses its activity. We also show that Smek1, which is predominantly nuclear in NPCs, is excluded from the nucleus during mitosis, allowing it to interact with cortical/cytoplasmic Par3 and mediate its dephosphorylation by the catalytic subunit PP4c. These results identify the PP4/Smek1 complex as a key regulator of neurogenesis. Neural stem and progenitor cells located in the ventricular zone (VZ) of the embryonic neocortex are mitotically active, self-renewing cells with the potential to produce differentiated cell types (Temple, 2001). During cortical development, postmitotic neurons generated from NPCs migrate radially out of the VZ and form the cortical plate (CP) in an “inside-out pattern,” eventually establishing a six-layered cortex (Kriegstein et al., 2006). The timing of neuronal differentiation determines the size of the progenitor pool, the final number of neurons, and cortical thickness. However, the molecular mechanisms that control the switch from proliferation to neuronal differentiation of NPCs remain incompletely understood. Studies of Drosophila neuroblasts show that the serine/threonine protein phosphatase 2A (PP2A) inhibits self-renewal and promotes neuronal differentiation by regulating the phosphorylation status of cell fate determinants, including Numb (Wang et al., 2009). Bazooka, a key component of the Par protein complex, is a well-characterized PP2A substrate in Drosophila neuroblasts (Krahn et al., 2009; Ogawa et al., 2009). PP2A antagonizes phosphorylation of Bazooka by Par1 kinase to control its subcellular localization. In mammals, a protein called Partitioning-defective 3 (Par3), the ortholog of Bazooka, accumulates at the tip of a growing axon in neurons and controls axon specification (Shi et al., 2003). Recently, it has been shown that Par3, which is enriched in the apical domain of NPCs of the VZ (Imai et al., 2006), critically regulates proliferation versus differentiation during cortical development (Bultje et al., 2009; Costa et al., 2008). PP4, which belongs to the PP2A family, is a protein complex comprised of a catalytic subunit PP4c plus regulatory subunits (Gingras et al., 2005). Smek (also termed PP4R3) has been identified as a PP4 regulatory subunit and implicated in activities as diverse as regulation of MEK (Mendoza et al., 2005), insulin/IGF-1 signaling (Wolff et al., 2006), H2AX phosphorylation (Chowdhury et al., 2008), and histone H3 and H4 acetylation (Lyu et al., 2011). A recent study reported that Falafel (Flfl), the Drosophila homolog of Smek, mediates localization of the adaptor protein Miranda and the cell fate determinant Prospero in neuroblasts (Sousa-Nunes et al., 2009). However, the direct substrate of Smek remains unclear. Here we identify Par3 as a direct substrate of the PP4/Smek1 complex in NPCs and report a novel role for Smek1 in regulating neuronal differentiation. During mouse cortical development, Smek1 is expressed in a distinct temporal and spatial pattern. At E11.5, we observed that Smek1 protein is expressed in most NPCs at the apical side of the forebrain VZ (Figure 1Aand S1A). At E14.5, Smek1 protein was detectable primarily in CP neurons (Figure 1B and S1B), while weak Smek1 expression was seen in some NPCs undergoing mitosis at the ventricle surface (Figure 1B, boxes). Interestingly, VZ neurons that migrate to the CP also expressed Smek1 protein (Figure 1B, arrows). In postnatal forebrain, Smek1 protein expression remained detectable in cortical layers I-IV (Figure S1C). Moreover, E14 cortices of Smek1-depleted mice (Smek1gt/gt) exhibited an increase in the number of Pax6-positive cells (an NPC marker) and a decrease in the number of Tbr1-positive cells (a marker of cortical neurons) as compared to E14 cortices of wild-type (Smek1+/+) mice (Figure 1C and S1D). To assess Smek1’ function in neurogenesis, we employed an in vitro culture system using NPCs isolated from the E11.5 mouse forebrain neocortex. NPCs transduced with lentivirus expressing shRNA againstSmek1 or control shRNA under control of a doxycycline-inducible promoter (Figure S1E) were cultured in medium containing doxycycline for 6 days under differentiating conditions and then assessed for neurogenesis using TUJ1 (a marker of immature neurons) or MAP2 (a marker of mature neurons). The number of TUJ1- or MAP2-positive cells significantly decreased in Smek1 knockdown cultures compared to cultures expressing control shRNA (Figure 1D), indicating a neuronal differentiation defect. A decrease in number of neurons can be caused by a defect in NPC proliferation or neuronal apoptotic cell death. While no significant difference in the number of apoptotic cell death (as determined by TUNEL staining) was observed between control and Smek1 knockdown cells cultured under differentiation condition (data not shown),Smek1 knockdown NPCs grown under proliferation conditions underwent hyperproliferation (Figure S1F and G). We then asked whether Smek1 regulated the transition of NPCs from proliferative to differentiation states by knocking down Smek1 in NPCs prior to placing them in differentiating culture conditions. Western blotting of cells expressing Smek1 shRNA showed decreased levels of TUJ1 protein relative to controls by day 1 of culture (Figure S1H). At this time point, we found that the percentage of undifferentiated NPCs expressing both Nestin (an NPC marker) and Ki67 (a marker of proliferation) or Pax6 increased in cultures expressing Smek1 shRNA compared to control cultures, while the percentage of TUJ1-positive cells significantly decreased (Figure 1E and F). These findings suggest that Smek1 is required for neuronal differentiation and suppression of NPC proliferative capacity at an early phase of differentiation. To determine Smek1 as a regulatory subunit of PP4 in neurogenesis, we asked whether Smek1 binds to the catalytic subunit PP4c in NPCs using co-immunoprecipitation. Western blot analysis revealed PP4c in Smek1 but not control immunoprecipitates, indicating that Smek1 physically interacts with PP4c. Such interactions did not change during differentiation (Figure 2A). To examine whether PP4c functions in neurogenesis, NPCs were exposed to lentivirus expressing PP4c or control shRNA and cultured as described in Figure 1D. PP4c knockdown led to changes similar to those accompanying Smek1 knockdown: relative to control cultures TUJ1 expression and the number of TUJ1-positive neurons decreased while Pax6-positive NPCs increased (Figure 2B and S2A and B). We next mapped Smek1 domains required for PP4c interaction. Smek contains four conserved domains: an N-terminal Ran-binding domain (RanBD), a domain of unknown function 625 (DUF625), an armadillo (Arm) repeat region, and a C-terminal nuclear localization sequence (NLS). We constructed a series of Flag-tagged deletion mutants, including Smek1ΔRanBD (lacking amino acid (aa) 2–100), ΔDUF625 (lacking aa 162-355), ΔArm (lacking 350-653), and ΔNLS (lacking aa 809-820) (Figure 2C, top) and introduced them or a wild-type construct into NPCs. PP4c was not be detected in anti-Flag immunoprecipitates from NPCs expressing Flag-Smek1ΔArm (Figure 2C, bottom) but was detected in cells expressing wild-type or other deletion mutants, suggesting that PP4c/Smek1 complex formation requires the Arm repeats. We also found that, while expression of wild-type Smek1 or corresponding ΔNLS mutant in cultures lacking endogenous Smek1 rescued the neuronal differentiation defect, the other mutants did not (Figure 2D and S2C and D). These results indicate that Smek1 regulates neuronal differentiation via its Arm repeats region through PP4c and suggest that both RanBD and DUF625 domains also participate in neurogenesis. To identify PP4 substrates regulated by Smek1 in NPCs, we employed affinity purification to purify proteins interacting with Smek1. Mass spectrometry analysis identified potential Smek1-binding proteins, including Par3, Kinesin-like protein, coiled-coil domain-containing protein 30 (CCDC 30), heat shock protein 90 (HSP90), PKC lambda, and HDAC1 Figure S3A. Among these, Par3, an intrinsic regulator of neurogenesis, is a particularly attractive candidate (Bultje et al., 2009; Costa et al., 2008). Using an antibody that detects the major isoforms (180, 150, and 100 kDa) of Par3, Western blot analysis revealed the predominant expression of two isoforms, 180 and 100 kDa forms, in NPCs, and that only the 180 kDa Par3 was detectable in Smek1 immunoprecipitates (Figure 3A). To determine whether Smek1/Par3 binding was direct, we performed an in vitro pull-down assay using purified Flag-Smek1 and His-fused Par3 fragments, the latter containing the CR1 domain (aa 1-338), the PDZ domain (aa 343-733), the aPKC-BR domain (aa 711-1054), or the C-terminal coiled-coil region (aa 1055-1334) (Figure S3B). Western blot analysis revealed that Flag-Smek1 pulled down only the Par3 coiled-coil region (Figure 3B), indicating direct binding through that region. Moreover, Par3 was detected in Flag immunoprecipitates derived from NPCs transduced with lentivirus expressing Myc-Par3 plus lentivirus expressing Flag-Smek1 wild-type or Smek1ΔRanBD, Smek1ΔArm, or Smek1ΔNLS constructs but not from NPCs expressing Smek1ΔDUF625 (Figure 3C). This result indicates that Smek1 DUF625 domain is required for Smek1/Par3 interaction. To assess potential dephosphorylation of Par3 by Smek1, we phosphorylayed Myc-Par3 protein in vitro by incubating it with an NPC lysate and 32P-ATP and then treated it with a complex containing Flag-Smek1 proteins (Figure 3D). 32P-labeling of Par3 was significantly decreased when Par3 protein was incubated with a complex containing wild-type Flag-Smek1 protein and PP4c (Figure 3D). By contrast, treatment with a Flag-Smek1ΔArm protein complex lacking PP4c binding significantly reduced Par3 dephosphorylation. Moreover, Western blot analysis of Par3 immunoprecipitates with an anti-phospho-serine/threonine antibody confirmed that Smek1 and PP4c regulate Par3 phosphorylation through serine/threonine residues (Figure S3C). Since the DUF625 and Arm repeats regions of Smek1 are required for binding to Par3 and PP4c respectively, we examined the Par3 phosphorylation state in NPCs expressing Flag-tagged wild-type or mutant Smek1 together with Myc-tagged Par3. Western blot analysis of Myc-Par3 immunoprecipitates using anti-phospho-serine/threonine antibody showed that overexpression of wild-type Smek1 or Smek1ΔNLS significantly decreased Par3 phosphorylation levels compared to controls, whereas overexpression of Smek1ΔRanBD, ΔDUF625, or ΔArm did not (Figure 3E). These results suggest that, in addition to the DUF625 and Arm, the RanBD domain of Smek1 participates in regulation of Par3 phosphorylation at serine/threonine residues. Next we asked whether Par3 is required for Smek1-mediated neurogenesis. To this end, we assessed the effect of Smek1 loss-or gain-of function on neuronal differentiation in the presence or absence of Par3. NPCs expressing either Smek1 shRNA or wild-type Smek1 were transduced with lentivirus expressing Par3 or control shRNA (Figure S3D). At day 1 after differentiation, in the presence of Par3, knockdown of Smek1 led to a decrease in the number of TUJ1-positive neurons and an increase in the number of Nestin/Ki67 double-positive NPCs, while overexpression of Smek1 had the opposite effect (Figure 3F and S3E). In the absence of Par3 by using shRNA, the number of TUJ1-positve cell was increased and the number of Nestin/Ki67 double positive NPCs was decreased. However, in these cultures knockdown or overexpression of Smek1 did not significantly alter the number of neurons or undifferentiated NPCs. In addition, we also observed increased expression of mRNAs encoding the Notch targets Hes1 and Hes5 in cells expressing Smek1 shRNA compared to control cells (Figure S3F). Moreover, analysis of Notch reporter gene activity revealed that wild-type Smek1 inhibited Notch signaling activity induced by Par3 overexpression, while Smek1ΔDUF625 did not (Figure S3G). Given that Par3 activates Notch signaling (Bultje et al., 2009), these results suggest that Smek1 acts upstream of Par3 to negatively regulate its activity in neurogenesis. Par3 loss of function promotes neuronal differentiation (Costa et al., 2008), consistent with the effect seen following Smek1 overexpression (Figure 3F). To confirm that Smek1 promotes neurogenesis by suppressing Par3 function, we transduced NPCs with lentiviruses expressing Par3 alone or Par3 together with wild-type Smek1 or Smek1ΔDUF625, cultured them under differentiation conditions, and then neuronal differentiation was quantified by determining the percentage of TUJ1-positive and Nestin/Ki67 double-positive cells one day later. Par3 overexpression decreased the number of TUJ1-positive neurons and increased the number of Nestin/Ki67-positive undifferentiated NPCs compared with control cells (Figure 3G and S3H). As expected, wild-type Smek1 negated the effect of Par3 overexpression, as determined by comparing the percentage of TUJ1-positive and Nestin/Ki67 double-positive cells in cultures expressing both Smek1 and Par3 to cultures expressing Par3 alone. In comparison with wild-type Smek1, no significant change was seen in cultures transduced with Smek1ΔDUF625, which cannot bind Par3. These experiments further confirm that Smek1 negatively regulates Par3 in NPC differentiation. Par3 localizes to the apical cortex of NPCs (Bultje et al., 2009), while Smek1 is predominantly nuclear (Figure 1A and C). To determine if changes in Smek1 subcellular localization occur in NPCs during neurogenesis, coronal sections from E11.5 forebrain were immunostained with anti-Smek1 and -α-tubulin (a cytoplasmic marker) antibodies. Smek1 co-localized with α-tubulin in cells on the ventricular surface (Figure 4A, arrows), indicating a cytoplasmic/cortical localization in mitotic NPCs. In mitotic cells, Par3 showed a similar localization (Figure S4A and B). Moreover, immunostaining of NPC cultures with anti-Smek1 and -α-tubulin antibodies showed that Smek1 undergoes dynamic changes in subcellular localization during mitosis. While Smek1 was nuclear in interphase and prophase cells, it showed a cytoplasmic/cortical localization from prometaphase to anaphase (Figure 4B and S4C). Metaphase and anaphase cells also showed Smek1 enrichment at spindle microtubules. The RanBD motif of the Dictyostelium discoideum Smek homolog is reportedly critical for its cytoplasmic/cortical localization (Mendoza et al., 2005). To test whether this was the case for mammalian Smek1, Smek1-depleted NPCs were transduced with constructs encoding Flag-tagged wild-type Smek1 or its deletion mutants and immunostained with anti-Flag and anti-phospho-histone H3 (a marker of mitosis and chromatin condensation). Consistent with results reported in Dictyostelium discoideum, the Smek1ΔRanBD mutant failed to localize to the cytoplasm/spindle during mitosis but rather localized in the nucleus and remained there in interphase (Figure 4C). The subcellular localization of other mutants tested resembled that of wild-type Smek1, with the exception of Smek1ΔNLS, which was expressed in both the nucleus and cytoplasm of interphase cells. Smek1ΔRanBD contains domains that can bind Par3 and PP4c, as shown by immunoprecipitation (Figure 2C and ​and3C).3C). We thus asked whether ectopic expression of Smek1ΔRanBD promoted mislocalization of Par3 and PP4c during mitosis. When we expressed Smek1ΔRanBD ectopically in Smek1-depleted NPCs, cytoplasmic/cortical Par3 remained unchanged while Smek1ΔRanBD was nuclear (Figure S4D). In addition, no difference in localization of Par3 between Smek1-depleted and wild-type Smek1 re-expressing cells was observed, suggesting that Smek1 does not alter Par3 localization. To evaluate PP4c subcellular localization, chromosome-associated and cytosolic protein fractions were isolated from M phase-synchronized NPCs and compared by Western analysis using indicated antibodies (Figure 4D). Interestingly, PP4c protein levels increased in the chromosomal fraction from cells expressing Flag-Smek1ΔRanBD compared to control cells or wild-type Flag-Smek1, while in the cytosolic fraction the level of PP4c protein decreased, indicating altered localization of cytoplasmic PP4c to the nucleus. Taken together, these results demonstrate that PP4c subcellular localization depends on Smek1 localization during mitosis and suggest that cytoplasmic/cortical localization of Smek1 targets PP4 to Par3. Neural stem and progenitor cells have been suggested as potential therapeutics for neurodegenerative disorders. However, understanding molecular and cellular mechanisms underlying their differentiation is a prerequisite to manipulating stem cell behavior. We show that Smek1, an evolutionarily conserved regulatory subunit of PP4, regulates neuronal differentiation and reveal an unreported function of PP4 in mammalian neurogenesis. Moreover, identification of Par3 as a novel Smek1-interacting protein and characterization of its conserved domains reveals a molecular mechanism by which Smek1 targets PP4 to Par3 during mitosis and negatively regulates Par3 function in neurogenesis. In this study we identify Par3 as a PP4 substrate. We propose that Smek1, through its DUF625 domain, binds directly to the Par3 C-terminus. In NPCs Par3 is primarily cytoplasmic in interphase and mitosis. Thus, nuclear export of Smek1 to the cytoplasm is required for its interaction with Par3. We show dynamic changes in Smek1 subcellular localization in NPCs. While Smek1 localizes exclusively to the nucleus in interphase, during mitosis it becomes cytoplasmic. The RanBD of several proteins reportedly recognizes GTP-bound Ran (RanGTP), which directs assembly of spindle microtubules allowing chromosomal segregation and cytokinesis in mitosis (Carazo-Salas et al., 2001). Smek1 enrichment at spindle microtubules in metaphase and anaphase cells suggests that its RanBD may function in a RanGTP-dependent pathway during mitosis. Notably, nuclear export of Smek1 to the cytoplasm was observed from prometaphase cells when microtubules invade the nuclear space, and deletion of the Smek1 RanBD abolished this effect, as seen by nuclear localization. Thus our data suggest that Smek1 subcellular localization is regulated through the RanBD and that this activity may depend on microtubule dynamics functioning in a Ran-dependent pathway. Most Smek homologs physically interact with the catalytic subunit PP4c (Gingras et al., 2005; Chowdhury et al., 2008), suggesting that the PP4 complex is evolutionarily conserved. We show that PP4c recognizes the Arm repeats region of Smek1 and its subcellular localization depends on Smek1 localization. Thus, nuclear export of Smek1 during mitosis facilitates dephosphorylation of Par3. This idea is supported by our observation that, while expression of Smek1 induced Par3 dephosphorylation in NPCs, expression of Smek1 mutants lacking RanBD and Arm repeats region did not. Interestingly, studies of Drosophila neuroblasts previously revealed that cell fate specification is tightly linked with phosphorylation status of bazooka protein (Betschinger et al., 2003; Krahn et al., 2009). However, it is now yet clear whether Par3 dephosphorylation directly regulates NPC neurogenesis. Although we could not identify specific phosphorylation sites targeted by PP4, our data defines three conserved domains of Smek1, namely RanBD, DUF625, and Arm repeats, necessary to target PP4 to its substrate Par3 and provides insight into the molecular mechanism by Smek1 to regulate PP4 function in NPCs. We here show that Smek1 suppresses Par3, a negative regulator of neuronal differentiation. Par3 acts upstream of Notch signaling (Bultje et al., 2009), which critically regulates cell fate decision of NPCs in cortical development (Gaiano and Fishell, 2002). Notch gain-of-function activity inhibits neuronal differentiation (Nye et al., 1994), an effect similar to Smek1 loss-of-function. Moreover, Smek1 inhibits Par3-induced Notch reporter gene activity. Although it remains unclear whether Smek1 inhibits Par3’s ability to activate Notch signaling during mitosis, ensuring a neuronal fate, our data demonstrate Smek1 as a negative regulator of Par3 in regulating neuronal differentiation and suggest a novel role for PP4 in mammalian neurogenesis. Acknowledgments We thank the USC Transgenic Core Facility for generating mutant mice. This research is funded by a NIH grant to W.L (5R01NS067213) and an NRF grant (NRF-2011-35B-E00015) to J.L.